This ain't your average lemonade stand! 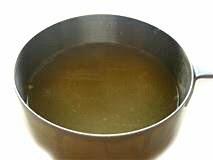 In a medium saucepan, over medium heat, add 3 cups of water. to make 3/4 cup of fresh lemon juice; set aside. Add the lemon rind and sugar to your pot of water and bring it to a boil. Boil for two more minutes. Add one cup of strawberries to the sugar mixture. The strawberries will begin to turn soft. against the side of the pot to incorporate them into the sugar mixture. Turn the heat down and simmer for two more minutes. Remove the saucepan from the heat and let the mixture cool. Using a fine strainer; strain your sugar mixture into a pitcher. Add your 3/4 cup of lemon juice to the lemonade. and place in the refrigerator to chill. "Mmmm, this is REALLY good!" and you will impress the masses of thirsty loved ones. Peel the rind from one lemon and juice your lemons to make 3/4 cup of fresh lemon juice; set aside. Add the lemon rind and sugar and bring to a boil. Boil for two minutes. Add one cup of strawberries to the sugar mixture. The strawberries will begin to turn soft. 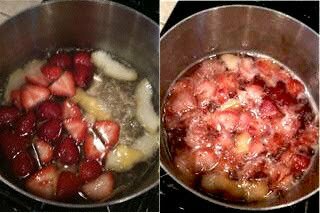 Take a wooden spoon and smash the strawberries against the side of the pot to incorporate them into the sugar mixture. Turn the heat down and simmer for two more minutes. Remove the saucepan from the heat and let the mixture cool. Add your 3/4 cup of lemon juice and the remaining cup of strawberries and place in the refrigerator to chill.